The Eagles have four prominent starters in the final year of their current contracts, including running back Jay Ajayi. Before the season started, Jordan Hicks called his agent and made a request that would be contrary to the demands of many players in contract years. "I actually told my agent, 'Give me my space,' " Hicks said. "I said, 'If it's something serious to talk about, then we'll talk about it. If not, leave me alone.'" In other words, if the Eagles offer an extension during this season, drop a dime. Otherwise, Hicks doesn't want to be distracted by the money side of playing in the NFL. There's already enough at stake, especially for the linebacker who has battled injury his entire career, the latest a ruptured Achilles tendon that ended his 2017 campaign. "Coming off last year and everything that happened, I think my perspective has changed and I'm just going out there and playing free, trying to stay as stress-free as possible and just enjoy the moment," Hicks said recently. "And I tend to play a lot better when I do that." Some players don't. Former Eagle DeSean Jackson had a difficult time focusing during the last year of his rookie contract and admitted so only after he was extended the following offseason. The Eagles, during Chip Kelly's one year in charge of personnel, gave Mychal Kendricks a new deal before his contract year, in part, because they thought the insecurity would be detrimental to his performance. Eagles executive Howie Roseman at training camp in July. Few teams, and that includes the Eagles under Howie Roseman, conduct business that way. There are a few preseason exceptions and the occasional in-season extension, but the NFL is a meritocracy and contracts beyond the first are given after the season and are based more on what the player has done rather than what he might do. The Eagles have four prominent starters in the final year of their current contracts. Along with Hicks, cornerback Ronald Darby, defensive end Brandon Graham, and running back Jay Ajayi are playing this season with their futures on the line. The same, to some extent, could be said of every player in the NFL. Contracts aren't guaranteed. Careers can be ended with a single collision. But Hicks, Darby, Ajayi, and even the 30-year-old Graham — because of his premium position — are set to sign multiyear deals this offseason, with the Eagles or not. It may seem like a down-the-road problem for Roseman, but he and his staff have long looked ahead to the 2019 offseason, particularly in how to construct the roster and salary cap with quarterback Carson Wentz eligible for what would likely be the largest contract in franchise history. Hicks and company, meanwhile, have seemingly pushed their contract situations to the back burner. "I don't know what they say with their agents and if they are talking and all that," Eagles coach Doug Pederson said Friday. "But once you go out to practice or you turn the lights on and the game's on, it's football, and these guys push all that stuff aside. "I talk a lot about eliminating distractions and that could be a source of a distraction for any player. So, I haven't heard it. Haven't seen it. Especially when we're out on the field." Of course, the best way to make sure the business side doesn't affect the performance side is to play well. It's a motivating factor. And while all four are playing at varying levels, for various reasons, there is an argument that could be made for keeping each beyond 2018. The same could be said for letting them walk. And that debate will extend to veterans with big contracts who can be either traded or released without a significant cap hit. Tackle Jason Peters, defensive end Michael Bennett, safety Rodney McLeod, and center Jason Kelce would be the most well-known names. It's an annual offseason tradition, but the Eagles haven't had a looming franchise quarterback contract to contemplate in more than 15 years. The Eagles and Wentz may wait to sign an extension until after his fourth season, assuming he stays healthy and continues his career arc, but the advantage of having a quarterback on a rookie contract is nearing its end. "There's a short window for guys who have big contracts, really, because, I think that, ultimately, obviously, you're going to have to pay Carson Wentz," Kelce said. "When that happens and how much that is, that's going to be a large amount of the salary cap. That's just inevitable." Jordan Hicks, Carson Wentz, Zach Ertz, and Chris Maragos (from left) talking during the Eagles’ minicamp in June. Hicks considers Wentz one of his best friends on the Eagles. The fact that his future with the Eagles may depend on the quarterback's financial windfall isn't lost on the linebacker. "Everybody knows that when it's up it's going to be big time," Hicks said. "He's obviously done a great job for this team, for himself, for this organization. He deserves every penny of it. But that's just the business. When you take the business part personally, that's when controversy comes and it becomes a distraction." Hicks has already developed thick skin. Labeled injury-prone dating back to college, the 26-year-old Texas product has missed 17 games in just over three NFL seasons. A torn pectoral muscle ended his rookie season after eight games and last year he suffered the Achilles rupture in Week 7. He said he returned in better shape than ever. He's running faster than he did before the injury and has increased his workload capabilities, according to team tracking systems. But Hicks can't run from a laundry list of woes — a first Achilles tear and hip injury date back to college — that will be used against him in negotiations. "I'm sure that's going to be the big argument and what we'll try to fight," Hicks said. "Sure. It's been a label I've had to fight for a while — since college. What I can focus on is how healthy I am right now. Make sure that I stay healthy." Ironically, Hicks' injury history might make him the most likely of the Eagles' free agents to be retained. It should keep his market at a reasonable price, particularly for a team that doesn't like to pay its linebackers, and that doesn't exactly have a replacement in the middle waiting in the pipeline. Darby may end up out of the Eagles' range. He hasn't been consistent since an August 2017 trade with the Bills, but he has raw speed and agility and doesn't turn 25 until January. Top cornerbacks also typically break the bank in free agency. The Eagles have been able to successfully stockpile young cornerbacks — with Sidney Jones, Jalen Mills, Rasul Douglas, and Avonte Maddox — which would make Darby expendable. He said that a second contract could be a dangling carrot, but it shouldn't enter the mind on game day. "I just want to win. That's all I care about. If we go out there and win, and I make plays when they present [themselves], then I feel like I'm doing good," Darby said. "Of course, the money, it makes people happy. There's a lot of people that get the contract and then don't do nothing after they get it." Ajayi hasn't ignored the elephant in the room. Before the season, he relished the opportunity to become the featured running back and how that would relate to his worth. Sure, he wants to stay in Philly, he has said, but the Eagles haven't shown a willingness to sign high-priced running backs, aside from the Chip Kelly-DeMarco Murray debacle from 2015. Unfortunately, for Ajayi and the Eagles, he has already been missing for much of the first three games. 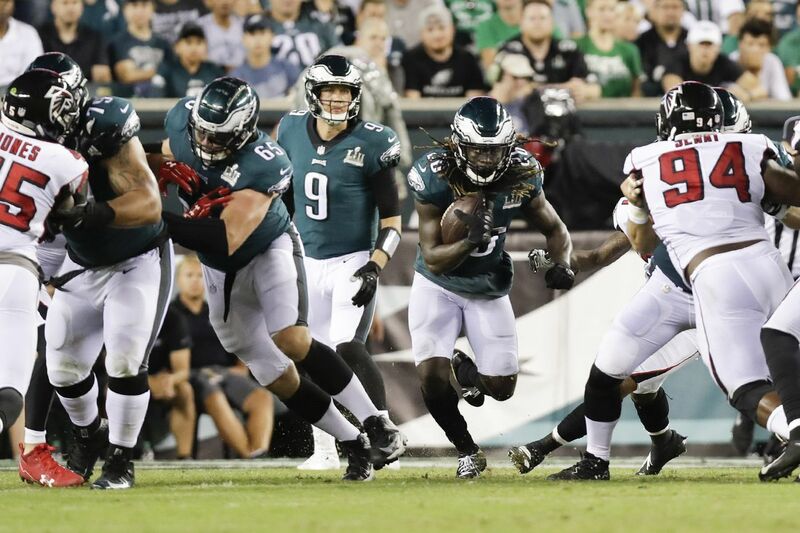 A preseason foot strain limited him to 15 carries in the opener, and a back injury on the first drive sidelined him throughout the second game and for all of the third last week. Ajayi is slated to return Sunday against the Titans, but he revealed Thursday that he had a small fracture in his back and would have to likely tolerate pain the rest of the season. It's unclear if the contract situation is behind his sudden return. Ajayi said he wasn't concerned how the injury may affect his production. "One game in my mind is not going to kill me in the long scheme of things," Ajayi said. "I believe in myself, that I'm great enough, that … I'm going to take care of business and it should sort itself out at the end of year with whatever contract." Jay Ajayi leaving the field in the first quarter of the Eagles’ loss to the Tampa Bay Buccaneers. Graham's departure would be the most noteworthy. He's the second-longest tenured Eagle, after Peters, and the oldest homegrown player. He has overcome microfracture knee surgery, a first-round "bust" label, Jim Washburn, a scheme change, and two coaching turnovers, and is still wearing midnight green. But the Eagles didn't extend him this offseason even though he recorded his highest number of sacks in 2017 (91/2) and forced the fumble to seal the Super Bowl victory. Ankle surgery in May might have complicated negotiations, but few players get to call their last shot. "I've seen a lot of guys I thought would never leave this place until they was done and they left," Graham said. "At the end of the day, they're going to do whatever is best for the team, moving forward for the future. Sometimes you're not in the plan. It's nothing personal." Graham believes he has at least three good years left. Defensive ends age better than those at some other positions. But he has gotten off to a slow start this season — he missed the entire preseason as he recovered — and has yet to notch a sack. "I'm motivated, for sure, because I understand I'm not only auditioning for here, but I'm auditioning for other teams, to let them know that I'm still me," Graham said. "I'm coming off an injury right now where I just got back and I want to let people know that I'm probably going to be better than I was because now I feel my ankle is stronger. "I try to go about my business as a professional and now I understand that the situation the team is in with having to keep Carson. They got 12 [draft] picks next year. They got a lot of guys [whose contracts are up] and I'm the oldest of them guys. I get it." There are older free agents — running back Darren Sproles, defensive tackle Haloti Ngata, receiver Mike Wallace, and safety Corey Graham — but they're on one-year deals and unlikely to return. The Eagles will turn the roster over again, and with Wentz's possible extension, Roseman will be on the hunt for cheap labor. That doesn't mean he can't be active in free agency or retain some of his own. The Eagles are projected to be around $20 million over the cap for 2019. But backup quarterback Nick Foles' salary is almost entirely voidable, as are others, and Roseman has always found ways to navigate the cap. But there will be tough decisions. Hicks, for his part, can't be bothered with thinking that far ahead. "If I'm taking care of business on the field, focusing on the product that I'm putting out there, then everything's going to fall into place, whoever it is, whatever they decide, whatever the situation is," Hicks said. "When the time comes, it will all work itself out."